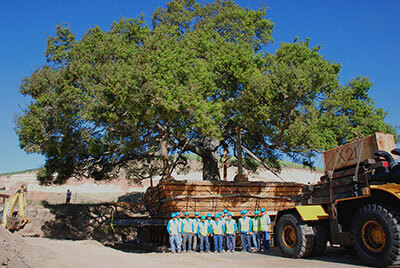 BrightView Tree Co. completed a massive tree relocation project, moving a 700,000-pound Quercus agrifolia (California live oak) to its new home in Orange County, Calif.
At 50 feet tall with branches spanning double its height and weighing about the same as a Boeing 747, the oak is the largest tree BrightView has ever moved. Phase one involved boxing the tree and moving it from its previous location to a temporary storage yard, but not until after the company brought the tree to full health. For two days, 14 team members using three backhoes excavated and installed the box around the roots of the tree while it took an additional two weeks to install the bottom boards and steel beams used for supporting its massive weight. Using hydraulic jacks, the team elevated the 30-by-30-foot box. BrightView team members loaded the tree onto two combined heavy haul platform trailers–each 12-feet wide with a total of 64 wheels–and pulled with a 2,500-hp tractor. Once the tree arrived in its storage area about a quarter of a mile away, BrightView team members continuously cared for the oak while waiting four months for roads to be built and graded so access could be made to proceed to the final phase of the project. For phase two, the tree was loaded back up on the transport platforms and taken on a six-hour journey to its final destination about a mile and a half away. Once the oak tree was at its final destination, team members lowered it to the earth with hydraulic jacks. Check out this video for a behind-the-scenes look at the project from start to finish. 1 Comment on "BrightView completes relocation of a 700,000-pound tree"